When Tonner Doll Company released their Scarlett, it was to much of the dismay of Scarlett doll collectors that the doll-heroine did not look much like the actress despite the press releases claiming: "in the likeness of Vivien Leigh" (there is a disclaimer though in the end that says: intended likeness). But that didn't stop collectors from buying Tonner's Scarlett. Personally, it is the additional costumes, the articulation that made the doll appealing to the market. But when Tonner released their Rhett Butler version, not only were collectors dismayed, they were aghast at the lack of likeness with the actor whether intended or not. 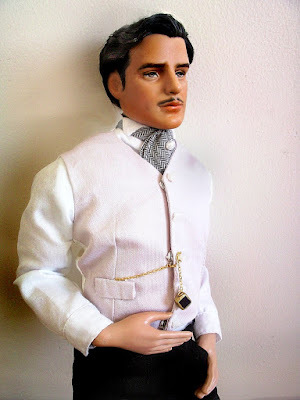 Tonner's Rhett Butler lacked the suave coolness and masculinity that the character was immortalized for. Brought to life by Clark Gable, Rhett Butler has been done by World Doll, Franklin Mint and Mattel (Mattel's sculpt, in my honest opinion the closest to the actor). I felt my Scarlett needed a man. The story was not complete without a Rhett. I thought of repainting the existing Tonner Rhett but the mold, the frame of the doll was not beefy and lacked the leading man attributes if placed vis-a-vis Tonner's Scarlett. So, scouting ebay I found Effanbee's Basil St. John. Thought of it. Saw that the hair could be styled. Had the widow's peak that could work for a Rhett. And so I purchased it. It is not Clark Gable, but in my opinion it looks good in Tonner's wonderful Rhett Butler suit. The suit's colors are accented by a pale pink vest. It is a 3-piece suit with a nice cravat accented with a pearl very much like Clark Gable's Rhett Butler suit. What's nice about the Basil St. John doll I got was its socks had gartered holders that held the socks up. Very becoming of a rich man like Rhett. The shoes are uniquely made for each foot. So, here you are Effanbee's Basil repainted as Rhett. I hope Scarlett will like him. Only the chemistry in the coming photo sessions will tell. He ain't Clark Gable, I surely hope he can live up to a Rhett. Thank you! I'm glad you liked this Rhett interpretation. = ) Thank you too for passing by.